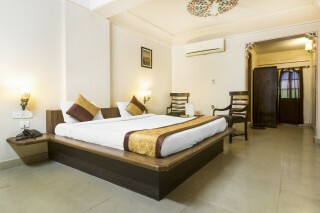 This is an offering of a private room in a guest house, which can accommodate up to three people. The property has an in-house restaurant, where you can enjoy delectable meals. 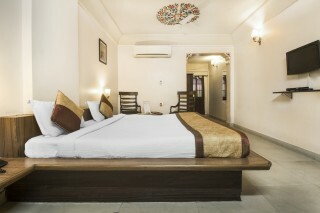 This guest house comes with amenities such as room service and housekeeping. The accommodation is in proximity to Rajput Palace (1 km), Fort Chandragupta (1.5 km), and restaurants like Copper Chimney (59 m). Your Space This abode boasts a traditional architectural style. The commodious terrace is complemented by arched domes that lend the space a distinctive touch. The boundary walls are vibrantly done with intricate latticework and symmetrically placed potted plants. The terrace is appointed with vintage lanterns and has seaters for you to comfortably enjoy your meals. It is also marked by plush leatherettes, thereby making for the perfect place to interact with travel companions. The room on offer is furnished with a comfy double bed with bedside tables and lamps, a wall-mounted television for entertainment, coffee seating, and a wardrobe with ample storage space. The en suite bathroom is well designed and equipped with contemporary sanitary ware. Guest Access Feel free to spend leisurely time in the common areas, on the terrace, and in the dining area when you are not in your room. Guest Interaction Feel free to reach out to the staff or the caretaker present in case you need any assistance. Neighbourhood Overview Hawa Mahal is located 4 km from the property. These are some of the other attractions nearby that guests can explore: Jantar Mantar - 3.2 km City Palace - 3.1 km Albert Hall Museum - 3.4 km Govind Devji Temple - 3.8 km Getting Around The property is located 3.1 km from the nearest railway station, 2.2 km from Sindhi Camp Bus Stand, and 12.1 km from Jaipur International Airport. Additional Information Guests are required to provide a valid ID proof at the time of check in. Breakfast is complimentary here. Please refrain from playing loud music. We do not host local residents. We regret any inconvenience this may cause. This beautiful property is in close proximity to tourist attractions such as the Hawa Mahal and Central Park. 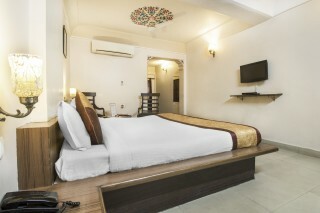 The rooms are big and well appointed with all the amenities such an air conditioner, wi fi connectivity and so on. The European architecture makes interiors of the rooms look majestic and traditional. The food here is well prepared and the hosts are very approachable. Property was very beautiful!! We enjoyed there with family..